Today I’m so excited to share with you one of my very favorite southern cookbooks, Melissa’s Southern Cookbook: Tried-and-True Family Recipes, published earlier this summer by my friend Melissa Sperka. Melissa is a fellow Carolinian and one of the friendliest and most hospitable southern ladies you will ever meet. There’s a good chance y’all already know Melissa from her hugely popular blog, Melissa’s Southern-Style Kitchen. 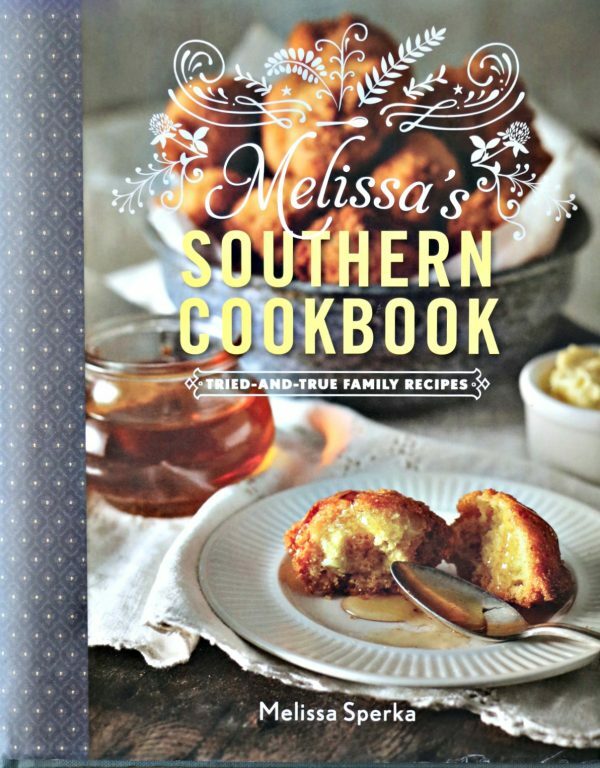 Melissa learned to cook from her mother and grandmothers and is one of those truly amazing southern cooks and her cookbook is full of one mouth-watering recipe after the other. 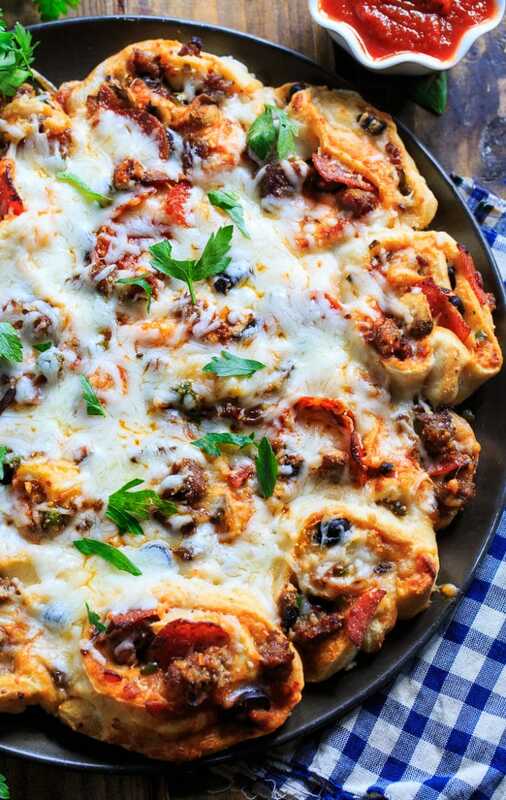 Today I’m sharing her recipe for Pull-Apart Supreme Pizza Pinwheels. This is a recipe the whole family will love and it can be served as an appetizer, snack, or along with supper. It will be perfect for the upcoming game season! I love that Melissa’s recipes have lots of layers of flavor, but they are all ingredients that are readily available. 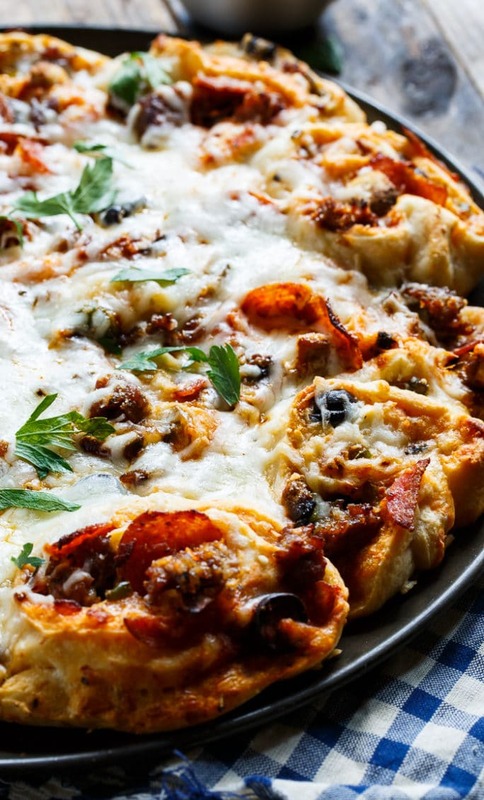 These rolls have it all: sausage, onion, pepper, mushrooms, olives, and pepperoni, plus pizza sauce and lots of cheese. Even with all these ingredients, using premade pizza dough makes these pizza rolls a breeze to make. They have so much gooey, melted cheese. Serve them with a bowl of warm pizza sauce and your family will be fighting over the last one. Find Melissa’s Cookbook at you local bookstore or order online from Amazon. 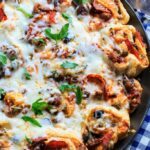 Pull-Apart Supreme Pizza Pinwheels have it all: sausage, pepperoni, onion, peppers, mushrooms, and lots of cheese! Preheat oven to 375 degrees. Lightly spray a 16-inch pizza pan with cooking spray. Set aside. In a medium-size skillet, heat a light drizzle of olive oil. Add the sausage, onion, green bell pepper, and mushrooms. Season with the Italian seasoning, garlic salt, and red pepper flakes. Cook for 10 minutes, or until no pink remains in sausage. Remove from the heat and drain or spread onto double-lined paper towels to remove excess oil. Stretch the pizza crust into a roughly 12x16-inch rectangle. Spread with 1/2 cup of the pizza sauce and sprinkle with 1 cup of the mozzarella cheese. 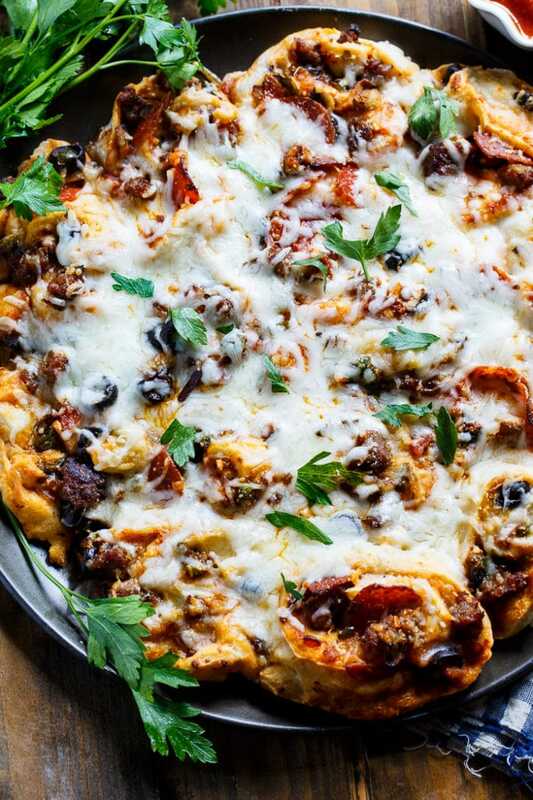 Sprinkle the crumbled sausage mixture over the cheese, arranging the black olive and mini pepperoni slices on top. 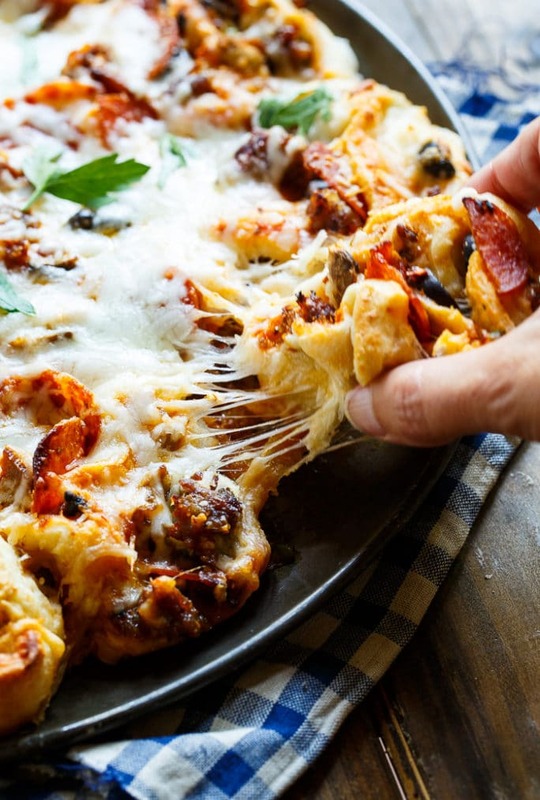 Cover with 1 cup of mozzarella cheese. Begin to roll, starting with the widest edge. Use a sharp knife to carefully cut into 16 equal portions.When cutting into portions, if the rolls come apart slightly, don't panic; rewrap and press together. 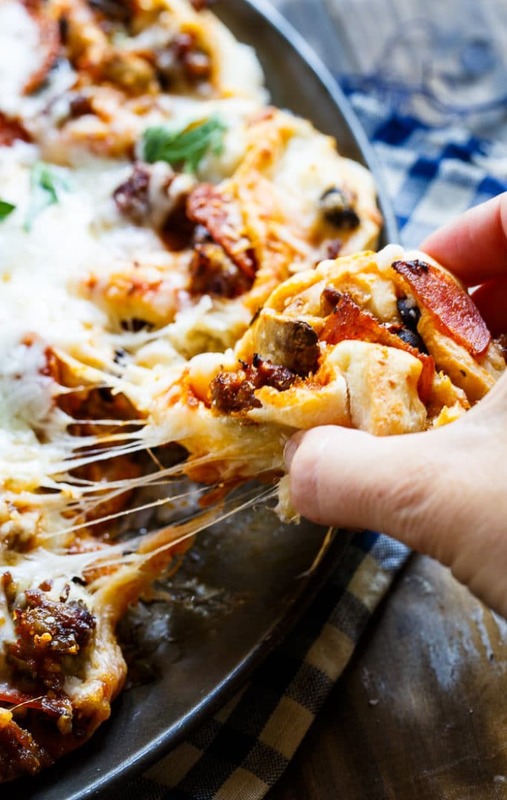 Place side by side on the prepared pan, starting in the center of the pan and forming into a circle.. As the cheese melts and the dough bakes, the filling will adhere. Bake for 20 minutes, or until golden. Sprinkle with the Parmesan cheese and the remaining cup of mozzarella cheese. Continue to bake for another 5 minutes, or until the cheese melts. Sprinkle with additional grated Parmesan cheese before serving, if desired, and serve with the remaining cup of warm pizza sauce on the side, for dipping. Recipe reprinted with permission from publisher. This entry was posted in Appetizers and tagged bread, Pizza. Bookmark the permalink.